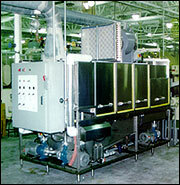 EKE also designs and produces industrial aqueous spray washers for customers like Briggs & Stratton. These washers are designed to fit in manufacturing cells where performance, footprint, and budget are all important. Modified Hobart machines incorporating high volume and low pressure are particularly effective. One feature that is common to the EKE industrial washer line is the reative use of disparate components - from oil skimmers, filters, and air knives all used to improve results and meet customers cleaning standards.